Decorating your home for Christmas is an occasion that the whole family waits for. It is a time to unpack the Christmas tree, bring out festive lights and adorn just about every corner with holiday cheer. If you're yet to decorate your home, why not consider making your own DIY decorations that are inexpensive, creative and a fun way to spend quality time with the family? Dating back to the 16th century, Christmas trees have become a symbol of the festive season and it is undeniably the most recognisable and widespread holiday tradition. No home is complete without a beaming tree complete with lights, baubles, ornaments and tinsels. Fortunately, crafting your own DIY decorations is an easy task for the whole family and it will give your tree a unique look. For example, you can create your own Santa decorations by using a face print-out and popsicle sticks or you can buy empty baubles where you can fill the inside with a family picture, names of your loved ones or even an air plant. Creating your own DIY lighting may seem like a tall order, however, it can easily be done using materials lying around your home. To create the perfect lighting for indoor and outdoor settings, you will need empty jars, vases, glass bowls etc. Once cleaned out and the labels are removed, you can then decorate the inside with glow in the dark paint, glitter, pine cones and other festive trinkets. Complete the look with battery powered tea lights or fairy lights. Incorporating small sprigs of greenery around your house is a great way to bring in the season. Simply display sprigs of eucalyptus and rosemary on your main table or other countertops to infuse your home with a natural look and provide it with a pleasant and fresh aroma throughout. 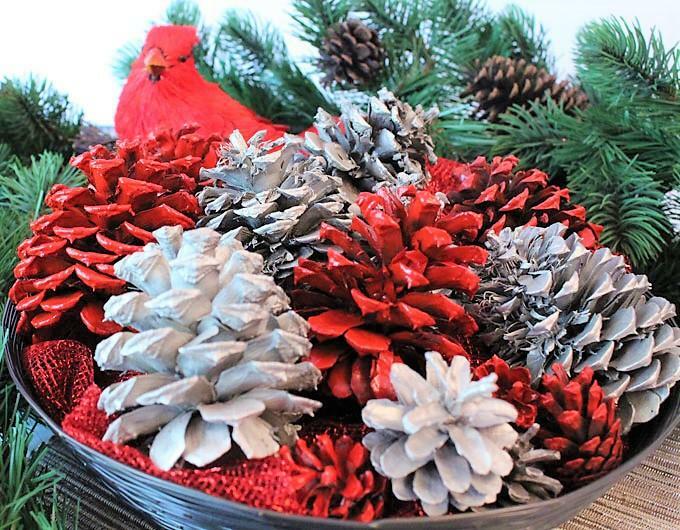 Alongside this, you can incorporate natural woodland elements like pine cones to complement the greenery. Simply place a cluster of pine cones with some sprigs on your tabletop for an elegant arrangement. You can take your DIY skills even further by painting your pine cones and arranging them in your favourite bowl. Christmas wreaths have become one of the most beloved Christmas decorations and its unique place at the front door adds festivity to the neighbourhood. Although wreaths can be difficult to make on your own, there are variations to make it easy for everyone. All you need is a metal or Styrofoam ring and some of your favourite ribbon. Cut the ribbon into two 16cm long pieces and then tie bows around the ring until the wreath is filled with ribbons. Empty wine bottles are great to use for decorating spaces around your home. These will need to be fully painted using acrylic paint, which can be found at any craft store. You can then come up with fun designs for the bottles such as spelling out words or drawing famous Christmas characters such as reindeers and snowmen. When complete, you can top your wine bottle with flowers or branches with ornaments hanging down. Make this festive season one where your unique touch emanates throughout your home. DIY Christmas decorations will keep you and your family having endless hours of fun while creating unforgettable memories.